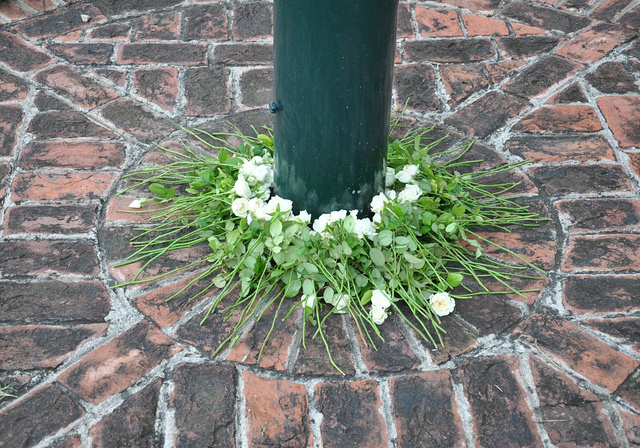 Flowers at base of flagpole during commemorative ceremony on eve of 10th anniversary of 9/11. 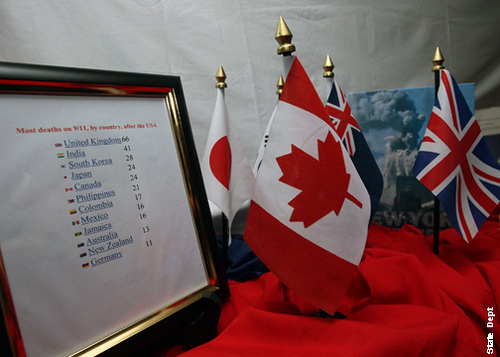 A display of flags and a list commemorating those people of Australia, Canada, the UK, Japan, and Korea, who lost their citizens during the 9/11 attacks. U.S. Consul General Anne Callaghan was on hand to commemorate the event. She thanked service personnel from both sides of the border and recalled the remarkable support and assistance that Canadians offered the United States on and after September 11, 2001. Britain’s Prince Charles (R) and Duchess of Cornwall, Camilla arrive to greet, Prime Minister David Cameron and U.S. Ambassador Louis Susman Deputy Prime Minister Nick Clegg Mayor of London Boris Johnson and leader of the opposition Labour party David Miliband as they attend the tenth anniversary ceremony to commemorate the attacks on the World Trade Centre in New York at the memorial near to the U.S. Embassy in London September 11, 2011. (Photos here by Luke MacGregor Reuters). 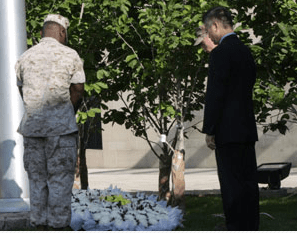 Ambassador Gary Locke participates in a wreath-laying ceremony on September 9, Friday, to commemorate the 10th anniversary of the September 11, 2001 terrorist attacks. 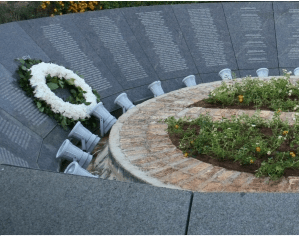 On September 9, 2011, the American and Lebanese staff at the U.S. Embassy in Beirut gathered to commemorate the 10th anniversary of September 11, 2001, and to honor the victims of the attacks on the World Trade Center, the Pentagon, and the high-jacked planes. The Embassy community was joined by the families of Lebanese victims of the attacks. President Nicolas Sarkozy and U.S. Ambassador to France, Charles Rivkin lay a wreath to pay tribute to the victims of the 9/11 attacks, Sept. 9, 2011. This is my September 11, 2001. It was a lovely early autumn day in Washigton DC. Bright sun, warm but not hot. I was listening to a lecture by a noted academic at the State Department training center as we heard a terrible crash. I thought perhaps a serious construction accident or a building collapse. Soon after, we were all told to evacuate the building and head home. As I headed out, I passed a hallway TV showing scenes of the first plane to hit the Twin Towers. I started to run. The car radio had more information. A plane crashed into the Pentagon. A second plane into the Twin Towers. We then lived very near the Pentagon so as I got closer, I saw the smoke pouring out of the Pentagon. Sirens filled the air. Roads were blocked and I had to prove to the police that I did indeed live just a few blocks away to be allowed to drive on to my house. Neighbors were standing in the street — weeping. But I wasn’t yet sad. I was incredulous. How could anyone destroy so many lives? It defied belief. Once home the phone was ringing. My late father-in-law calling from West Texas to ask if we were okay. A decorated World War II career Army officer, he was normally crisp and composed. His voice on the phone was filled with fear. “Where is Bill? Did he have meetings at the Pentagon today?” I didn’t know. As usual, we had both dashed out the door, talking more about what time we’d be home that evening rather than exactly what each of us was doing that day. I promised to call as soon as I knew. Moments later, Bill literally ran in the door. Traffic was so jammed that Bill parked his car, put on his jogging clothes, and ran the five miles from the State Department to our house. We spent the rest of the day glued to the television. By nightfall, we were filled with sadness, knowing that thousands were dead, citizens from dozens of nations. Every September 11 since then, I get a lump in my throat when the film is shown of that day. But after ten years, I am determined that starting this year, I will remember instead the acts of heroism and compassion that characterized September 11. That I will remember with pride those who rescued victims, those who lost their lives diverting another plane that would have targeted Washington DC, the compassion of volunteers, and that feeling of immense unity we felt around the globe. I will not forget the lives lost but from now on when I think of September 11, I will remember heroism, compassion and unity. Via Ambassador David Huebner’s blog: … [A]t St Andrew’s Church in New Plymouth. Led by my friend the Reverend Kim Francis, the memorial drew more than 500 Kiwis, Americans, Irish, and others to pray, sing, remember, and show solidarity. Our Marine Band joined St Andrew’s choir to provide music. I was joined at the front of the congregation by the entire USA Eagles team and other special friends including Mayor Harry Duynhoven and the Mayoress, MP Jonathan Young, and my colleagues Ambassador Frankie Reed, Special Representative Reta Jo Lewis, and ANP Desk Officer Michele Petersen.